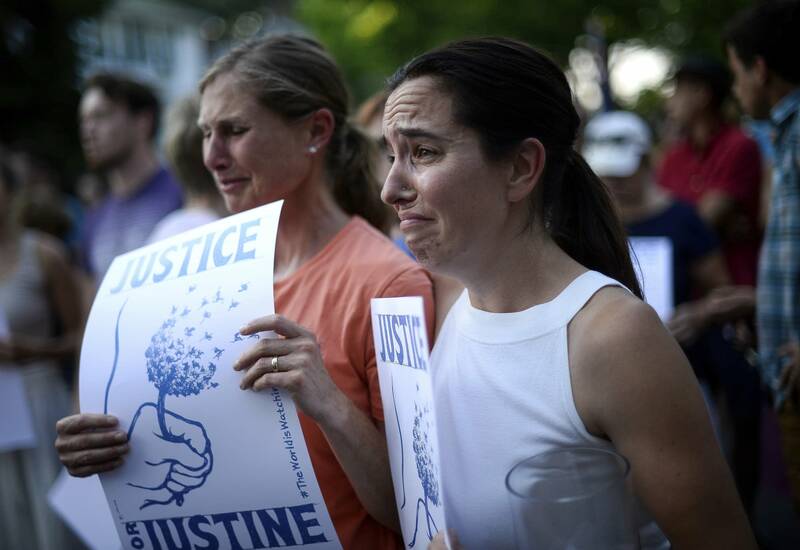 After the fatal police shooting of Justine Ruszczyk, some Minnesotans say they want police culture in Minneapolis to change quickly to avoid future incidents. But changing police culture — and the laws that protect law enforcement — may be easier said than done. There are still many unanswered questions about exactly what transpired in the moments before and after Officer Mohamed Noor shot Ruszczyk in the alley behind her house last week. Noor's partner, Matthew Harrity, told investigators that he was startled by a noise just before Ruszczyk appeared at the driver's side of his squad car, and that Noor then fired his weapon from the passenger side, hitting the 40-year-old woman. Noor has so far declined to speak with investigators. And there's no body camera or squad-car video of the shooting. But as questions swirl around why Noor shot Ruszczyk minutes after she called 911 about a possible assault nearby, community members say police culture needs to change. "As a citizen who lives in a city where there's been some shootings, to keep hearing the excuse that they fear for their lives as a way to legitimize shooting someone falls flat with me," said a caller to a special MPR News program on Monday. "The whole point of their job is that they do the dangerous things, they do the risky things. They do risk their lives." "The standard is not 'Should the officer have pulled the trigger?' According to the U.S. Supreme Court, it is, 'Was that officer's decision reasonable based on what that officer perceived and what their feeling of risk was?'" Gaertner said that after the shooting of Ruszczyk, and that of Philando Castile in Falcon Heights last year, she hears many people say they want the laws changed so officers don't have as much leeway when it comes to discharging their weapons. Ginger Charles, executive director of the Center for Spirituality and Policing, said officers are trained to think that their lives are constantly under threat. "We really have created a systemic culture of fear within law enforcement," she said. To change that, Charles said, officer training must also change. She said cops are often taught that the only way they can defend themselves and the community is with firearms. Jim Bueermann, president of the Police Foundation, said police training needs to be re-engineered to put officers in highly charged situations without putting lives at risk. He said there's technology available to create an immersive training experience for cops. Take virtual reality, for instance, which is already used for pilots and people in medical professions. "Wouldn't we rather officers go through these critical situations in that virtual setting, before they hit the street?" he asked. But Bueermann warned that even the best training can't keep officers from having to make split-second decisions, often under challenging circumstances and with little information. Until society can understand that aspect of policing, people will continue to be upset when police use deadly force, he said. MPR News host Kerri Miller talked to five guests about police shootings in Minnesota. Use the audio player above to hear their conversation.